HTC Vive™ today announced that the HTC Vive Pro™ Head Mounted Display (HMD) will be available for $799 with global pre-orders starting now. The company also announced a $100 price reduction for the current Vive full kit, bringing it down to $499. All Vive Pro HMDs purchased by June 3rd, which will begin shipping on April 5th, will come with a free six-month trial to Viveport Subscription, where consumers can choose up to 5 titles per month from the more than 400 titles available. Vive Pro HMD pre-orders begin today on Vive.com and other Vive retailers with units shipping globally on April 5th. Current Vive owners can upgrade their headset to Vive Pro for the best display, audio, and comfort in the industry. 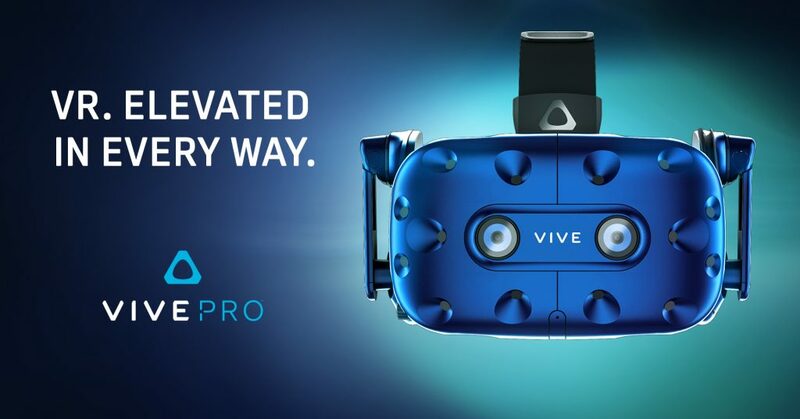 The Vive Pro comes with dual-OLED displays, making for a crisper image resolution of 2880 x 1600 combined, a 78% increase in resolution over the current Vive HMD. In addition to visuals, Vive Pro also features integrated, high-performance headphones with a built-in amplifier that creates a heightened sense of presence and sound through noise cancellation capabilities. These improved graphics and audio allow for users to experience VR with enhanced clarity, making it the most realistic and immersive VR experience on the market today. In addition, the Vive Pro has been rebuilt to maximize comfort for the most demanding VR users. The Vive Pro features a redesigned head-strap that balances the weight of the headset more evenly and features easy simple adjustment buttons for Vive users with glasses. The Vive Pro works with both SteamVR Tracking 1.0 and 2.0, meaning existing Vive customers can upgrade the headset only and continue to use current generation controllers and base stations. With more than 3,000 titles available, Vive continues to be the platform of choice for developers and consumers alike. Operating in over 60 countries, HTC’s content platform Viveport brings premium experiences in entertainment, education, arcade, arts & culture, and enterprise to a global audience. In addition, Viveport Subscription allows consumers to choose from over 400 pieces of content from a highly-curated offering, giving consumers the opportunity to discover the best VR content available.